poem: 'Ode to the thumb'. César Baldaccini (1921 - 1998) from Marseille was one of the great sculptors of the twentieth century. Among César's casts of sculpted breasts, female torsos and clenched fists, it is the thumb (designed in 1965), that, above all else, has emerged as the artist's hallmark - his own, greatly enlarged thumb in bronze. 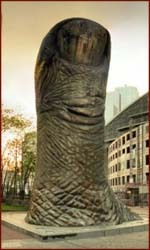 César's thumb sculptures are exhibited in many big cities in the world, including e.g. : Paris, Marseille, Shanghai & Seoul. The left picture above shows one out of three Pouce (thumb) named 'Le Pouce': this sculpture has a huge weight of 18 tonnes and height of 12 meters. Estimated between 900,000 and 1.2 million, this incredible artwork was auctioned as part of a sale prestige Drouot-Montaigne in Paris at the International Fair of Contemporary Art (FIAC). One of the three creations was recently purchased by a collector for a cool US $1,745 million. This is the highest amount ever paid for any of the Cesar's works till the date. 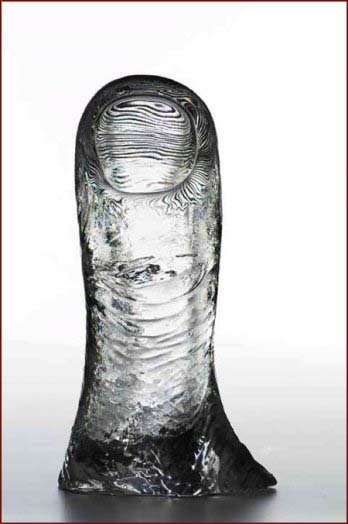 The crystal version (1989) of César's 'the thumb' (Le Pouce). Oh! mighty digit that thou art. From other fingers kept apart. Included only when called "hand". You do so point to some other land. You really do stand quite alone. Pointing off to some twilight zone. You are so often much abused. With such terms as "clumsy" so acused. There is much amusement at your expense. When the term "All Thumbs" is brought hence. The Thumb turned down by Romans meant. The quick demise for some vanquished gent. The Thumb turned upwards brings forth a grin. It's the international sign for good fortune. The victor is also oftimes praised. With this distant and silent digit raised. Even when unseen it's still in use. Holding back fingers to produce. That Boy Scout salute or Churchill's V.
It truly is used universally. To thumb your nose is the insult gross. It is often used when at a loss. For words four letters so oft abused. That only silent signs are used. You stubby digit by Jack Horner famed. But on those days when you are sore. You really hurt oh! so much more. Than all the others on the hand. Your prehensile acts are in much demand. So hurry back oh! mighty thumb. You see how important you've become!! In the summer of 2008 one hundred works of César Baldaccini were exhibited from early July till the end of october at 'la Fondation Cartier' for Contemporary Art, featured by Jean Nouvel, architect of the building and friend of the famous sculptor. 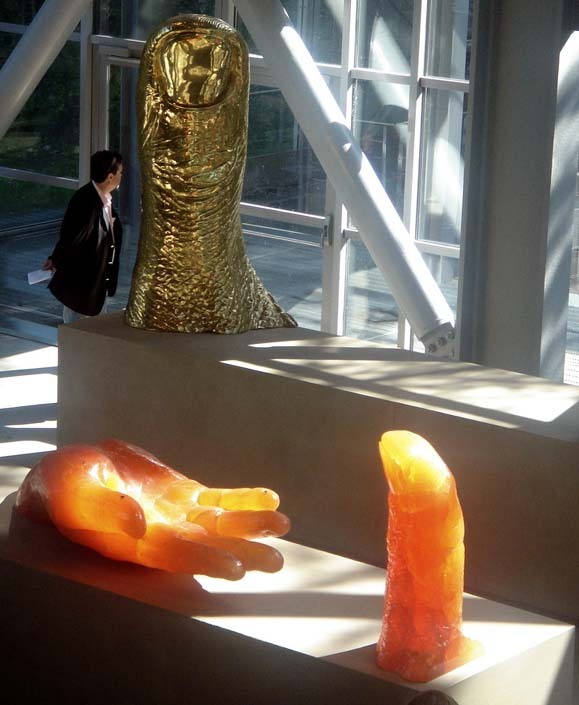 The visitors were able to discover many of César's famous thumbs, made by the artist with various materials including: bronze, Baccarat crystal, stainless steel, aluminum and pink marble. The picture below presents an impression from this remarkable César exposition: strong, bold and hypnotizing!! 'The thumb' (le pouce) in 'la Fondation Cartier' in: one hundred works of César Baldaccini, Paris (2008). and at best a pair of forcepts whose points don't meet properly. 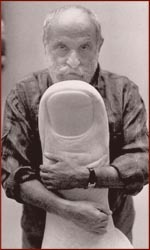 a stage when the thumb hand no independent movement and was just another digit."